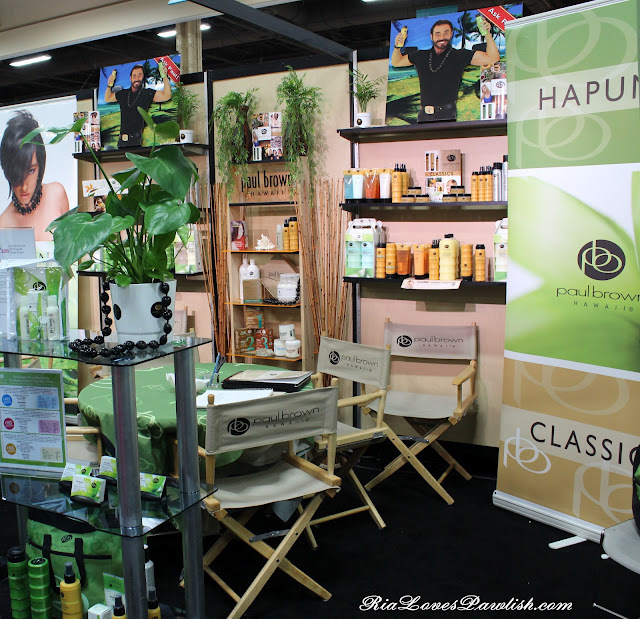 Ria Loves Pawlish: Cosmoprof 2012... More Exhibitors! 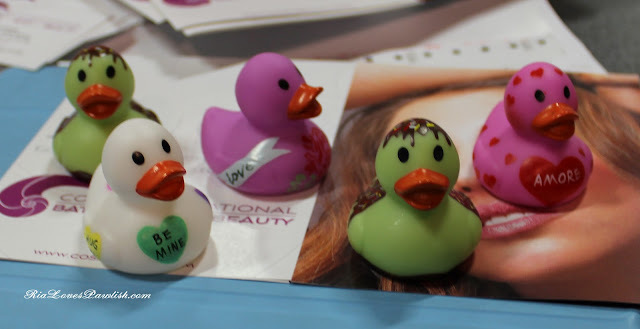 i'm getting close to the end of my Cosmoprof posts, i may have three more after this one. i decided to do another exhibitors post with multiple companies because i don't have as many pictures as i'd like for these. some i don't even have enough information for... there is such a learning curve to conventioning! i'm going to start off with Cacee BFE... or BFF... it's listed both ways on their website (www.CaceeInc.com), but their bottles do say BFE. the company gave me some bottles to try, and the polishes are lovely! they don't seem to be available for purchase yet (at least online). i will give more information once i start actual reviews! here's their display case... they have loads of gorgeous colors in all sorts of finishes! Ciate had a booth at the conference and were very nice to deal with in person. this restored my faith in them after all the Fish Egg Friday madness. they also were nice enough to give me a couple bottles for review :) i'm so frustrated at myself for not taking more pictures in their booth! 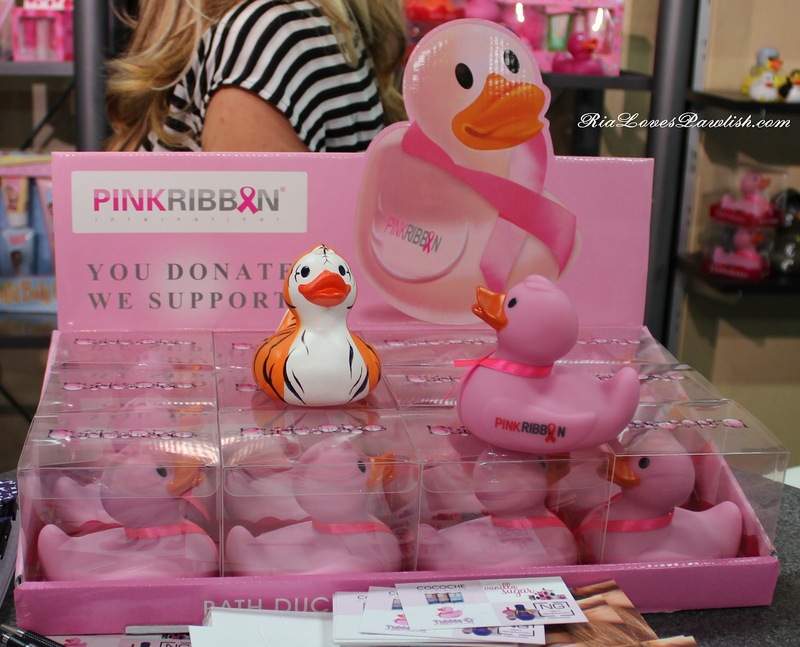 this is their display rack... their bottles are SO cute with the little ribbon bow! check them out at www.ciate.co.uk. i want to show this quick shot of the Paul Brown Hawaii booth... i love how much effort they put into making it look exotic! their booth definitely stood out. Paul Brown makes hair care products, i have some they gave me for review... but i won't be able to try out their shampoo because my luggage drank it on the way home from Vegas! check their website out at www.paulbrownhawaii.com. Cosni International's booth had two lines that really caught my eye... their Cocoche makeup and their Tubbie :D rubber duckies! check out their website at... www.cosnibeauty.com. here are a few shots of Cocoche... the first one doesn't have any nail polish visible... the other makeup products in the display are covering it up! they also have out a line of magnetic polish... they were nice enough to give me some samples so polish reviews coming up! and these Tubbie :D duckies are just so cute... i wish i had more photos, there were just so many varieties! last up is LA Colors and LA Girl... i didn't have a chance to talk to the company, but i did get some great shots of their displays! 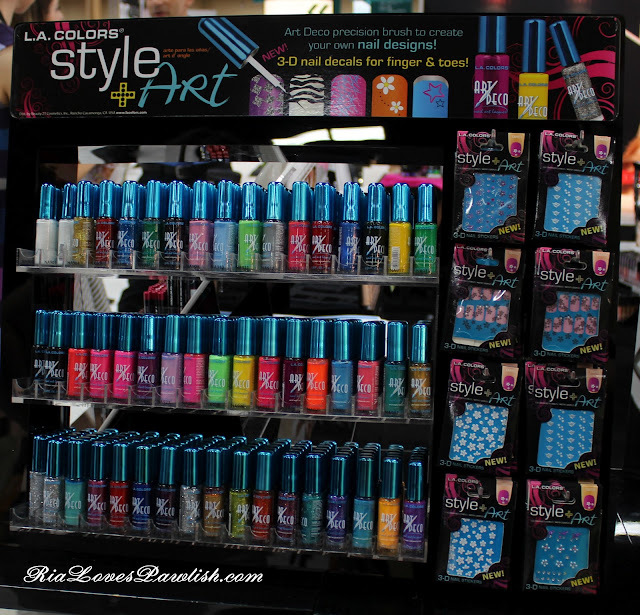 here is LA Color Art Deco nail art brushes... check out LA Color at www.lacolors.com. and LA Girl has some really cool collections coming out, like Ombre and Polka Dot manicure manicure kits! check them out at www.lagirlusa.com. 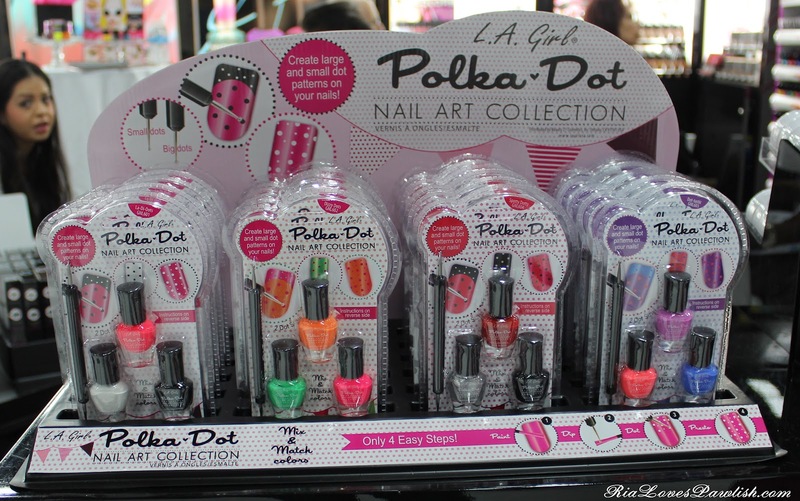 i love that the Polka Dot kits come with double ended dotting tools AND three polishes... the possibilities are basically limitless! Ooh! 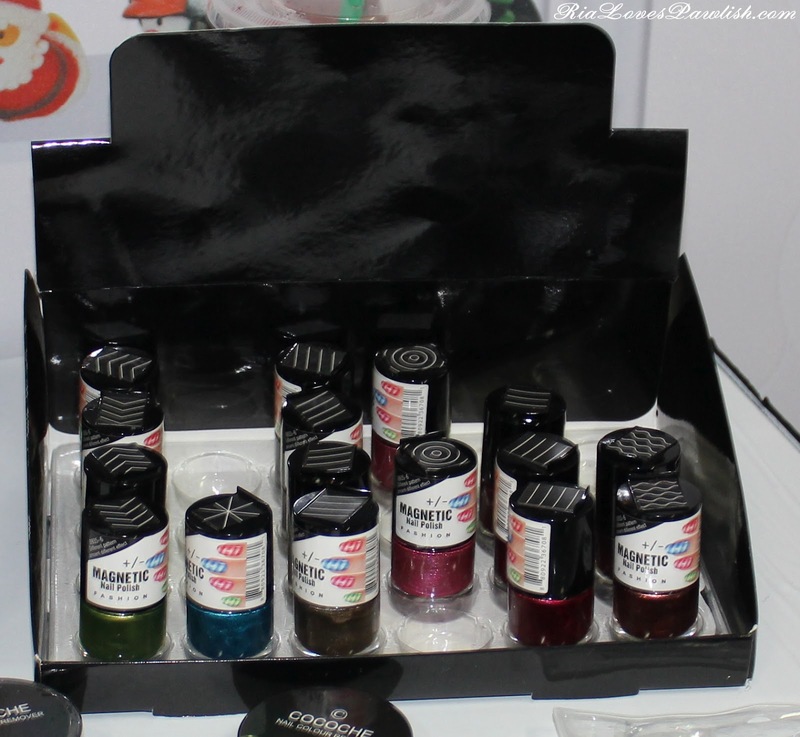 Love the LA Girl Ombre kits! i think they are such a great idea... it makes it so easy to take advantage of that trend!